Worthing & Adur Chamber of Commerce has taken the lead in developing a new charitable fund for the area called the ‘Worthing & Adur Fund’, in partnership with Sussex Community Foundation, a charity that develops and supports local giving. A number of local individuals and businesses have become Founder Donors giving a minimum of £1,000. This provided the seed donations to establish the core endowment fund. Initial donations were also matched pound for pound through the Government’s Grassroots Endowment Challenge, designed to encourage the development of permanent funds, the income from which will be used to support local charities and community projects. The Fund is open to ongoing donations and it is hoped to further build this important resource for the local community. All applicants must be not-for-profit community organisations and be working for the benefit of the people in Sussex. You do not have to be a charity but you will need to have your own bank account and be able to provide a signed copy of your constitution and accounts, a copy of a recent bank statement, estimates for proposed purchases (if applicable) and copies of relevant policies. If you are unsure what to do or have questions about the grants please contact Sussex Community Foundation on 01273 409 440. On receipt of your application Sussex Community Foundation will contact you to advise when you are likely to hear the outcome. In 2002 Mick and Chris Smith, retired residents of the Broadwater area of Worthing decided to do something about the increasing problem of anti-social behaviour in their area. The project they started has developed into Mick’s Garage Community House which acts as a hub for a range of activities for the whole community. They received a grant for the salary costs of an advice worker.Mick Smith is pictured with John Peel, Chairman, Sussex Community Foundation. One of the first Grassroots Grant recipients, Worthing D&D run evening basketball sessions for 8 – 18 year olds at Durrington High School. The funding allowed the group to offer the sessions at a low-cost, ensuring that children from families on low incomes could attend. Home-Start Worthing & Adur aim to give parents the support they need to carry out this demanding and rewarding role. The grant supported the costs of a play worker and play equipment. Superstar Arts CIC’ Super Friends offers social activities (days out and holidays) in a supported environment for people with learning disabilities. Funding is for the Super Friends relaunch, covering the costs of printing, marketing, administrating/project management, running costs of the minibus and subsidised places for those unable to afford the full cost of holidays & trips. CircusSeen provides affordable circus skills training to the Worthing Community. This grant was towards the costs of venue hire and the purchase of tents. Cruse exists to promote the wellbeing of bereaved people and to enable anyone suffering bereavement caused by death to understand their grief and cope with their loss. West Sussex Area Cruse includes three local branches – Worthing, Chichester and Mid Sussex. This grant will help with a range of core costs (part-time staffing, rent, training and phones). Electric Storm Youth is a youth work charity in Lancing needing basic camping equipment for young people to be able to join Electric Storm Youth-run camping trips and those that are part of the Duke of Edinburgh scheme, irrespective of income. This grant will pay for eight two-person tents. The Friends of Oak Grove College is the parent teacher association for Oak Grove College, a secondary and sixth form education establishment for pupils with special educational needs. This grant is to extend the services of the signing choir to other community groups and will cover the cost of personalised t-shirts for choir members, transport costs to events and promotion of the service. This grant will help to fund a project aimed at keeping young people safe from crime and reducing anti-social behaviour by recruiting them is a series of workshops in dance, music, crime prevention and community safety. Funding is for staff costs (artists’ fees, 2 support workers & 2 activity co-ordinators), volunteer expenses, premises costs and admin & stationary etc. 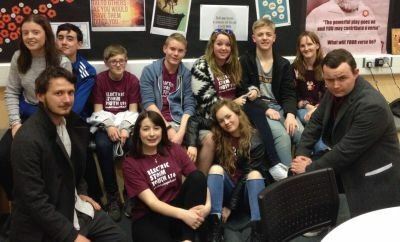 Maybridge Keystone Club is a youth group who offer a safe and secure environment for young people, in Castle Ward, Worthing which has significant deprivation and a high number of single parent families. Funding is to help create an area where they can cultivate vegetables. The U3A provide low cost learning, exercise, mental stimulation and social interaction opportunities for people no longer in full-time work. Activities include French; family history; exercise; singing for fun and art appreciation. Are you a charity or community group that needs funding for a project? The Worthing and Adur Fund gives up to £500 in grants to small charities and community groups working in Worthing and Adur. The next deadline for applications is Friday 5th May 2017. Worthing Speakabout, an advocacy group run for and by people with learning difficulties. Grant went towards running costs, office rent, mini bus and hire of meeting room at Buddy's Cafe. Worthing Gymnastics grant helped to fit out their new venue with essential apparatus. Storm Ministries serves the local community through various activities, clubs and events. Their funding provided disabled access via a ramp with hand rails. The latest donations to this growing fund are making such a difference to Voluntary and Charity groups across Worthing & Adur. As a result of the Superstar Arts presentation at the recent Chamber Breakfast with our local MP’s , the fund received a cheque for £1000 from Sir Peter Bottomley MP for Worthing West! A very big thank you to Sir Peter! individuals and businesses to become Founder Donors of Worthing and Adur Fund. Businesses continue to donate to the fund enabling local people to manage the distribution of grants with emphasis on local small groups where a small grant of around £500 can make a significant difference. £700 to CircusSeen which provides affordable circus skills training to the Worthing community. £500 to Cruse Bereavement Care West Sussex to help with a range of core costs (part-time staffing, rent, training and phones). £500 to Electric Storm Youth Ltd, a youth work charity in Lancing to pay for eight two-person tents. £400 to Friends of Oak Grove College to extend the services of the signing choir to other community groups. £500 to Heene Community Association to help fund a project aimed at keeping young people safe from crime and reducing anti-social behaviour. £500 to Superstar Arts CIC to help to fund the Super Friends relaunch, covering the costs of printing, marketing, administrating/project management, running costs of the minibus and subsidised places for those unable to afford the full cost of holidays & trips. £500 to Maybridge Keystone Club youth group for young people in Castle Ward, Worthing, to help create an area to cultivate vegetables.